﻿ Expertise: Heavy Lifting and Transportation | Amirkabir Co. Combining the capabilities of our equipment with our extensive experience, AmirKabir can supply the optimal method for virtually every type of lift. In industrial construction and plant maintenance projects, large and heavy components need to be lifted. Such lifts must take place safely –safeguarding the people involved, the load itself and the adjacent structures. Also, they should be organized to achieve optimal overall project efficiency, in order to maximize uptime of plants. In its longstanding history, AmirKabir has carried out every lifting project made possible by technology and engineering – from straightforward single lifts to complex innovative projects requiring newly designed equipment. AmirKabir has the world’s largest and most modern fleet of lifting equipment, ranging from a 10-ton all terrain crane up to our in-house developed PTC’s; able to lift 4,400 tons when rigged to maximum capacity. AmirKabir`s jacking systems are utilized to push up objects that vary widely in dimensions and weight – from several tons up to record-breaking weight. For optimal reliability and safety, the entire AmirKabir fleet is subject to strict maintenance schedules. 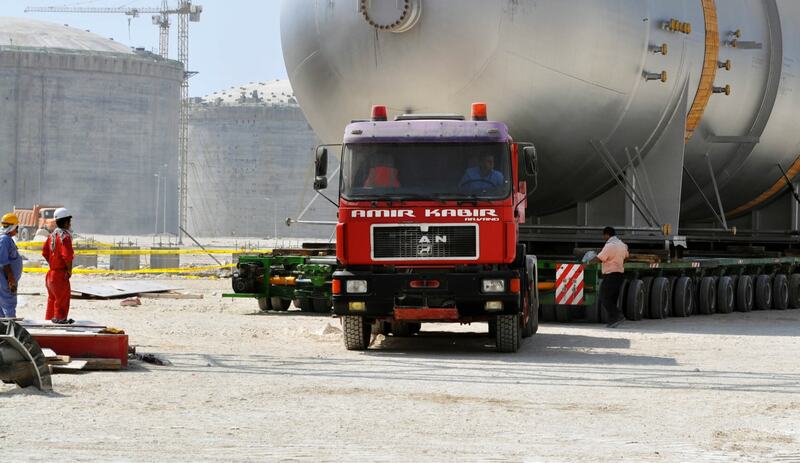 With an unparalleled range of equipment available, AmirKabir can provide a cost-effective and safe approach for the transport of heavy and oversized objects. In many industries, plants are being constructed at ever-larger scales. The same trend is seen in civil construction projects, where infrastructures continue to increase in size. These changes require that ever larger and heavier objects – such as components, prefabricated modules and infrastructural elements like bridges – are fabricated, transported and installed. As a consequence, the requirements for transport services are changing, and service providers must accommodate bigger dimensions and heavier weights while adhering to increasingly higher safety standards. The right transport solutions meet these needs and can help optimize construction schedules and, in many cases, move deadlines forward. AmirKabir`s roots are in transportation: the original company from which AmirKabir eventually emerged was founded in 1807, when a visionary entrepreneur foresaw increasing demand for the transportation of heavy loads. Since then, AmirKabir has developed a deep global expertise in virtually every type of heavy transport in any circumstance across the world. Our modern fleet of transport equipment is unparalleled in range and capacity, encompassing everything from conventional trailers and barges to skidding systems and SPMTs. Furthermore, our fleet is subject to stringent maintenance programs that uphold the highest standards of reliability and safety. By managing all lifting and transport activities necessary for a construction project, AmirKabir`s site wide construction services help make construction safer, faster and more cost-effective. Constructing plants in heavy industries is complex, with multiple activities simultaneously performed by diverse contractors and subcontractors. Each contractor works according to their own scope of tasks and schedule, deploying their own equipment for lifting and transport and employing the people to operate it. However, their individual efforts are generally not aimed at overall project efficiency and optimum utilization of resources – often leading to situations where too much lifting and transport equipment is on site, under-utilized and causing congestion. Most importantly, a lack of coordinated lifting and transport activities may bring about a sub optimization of safety. An alternative is to take all heavy lifting and transport activities out of the scope of individual contractors, and to put them under the responsibility of a single heavy lift and transport contractor. This serves the overall objective of the entire project: to bring the plant online safely, cost effectively and as quickly as possible. AmirKabir’s site-wide construction services are designed to achieve just that: we engineer, plan, manage and execute all lifting and transport activities necessary for a construction project. For that, we link all contractor project schedules, find opportunities for planning efficiencies and develop one overall project schedule. In close partnership with the site owner, priorities, equipment requirements and risk management plans are assessed. 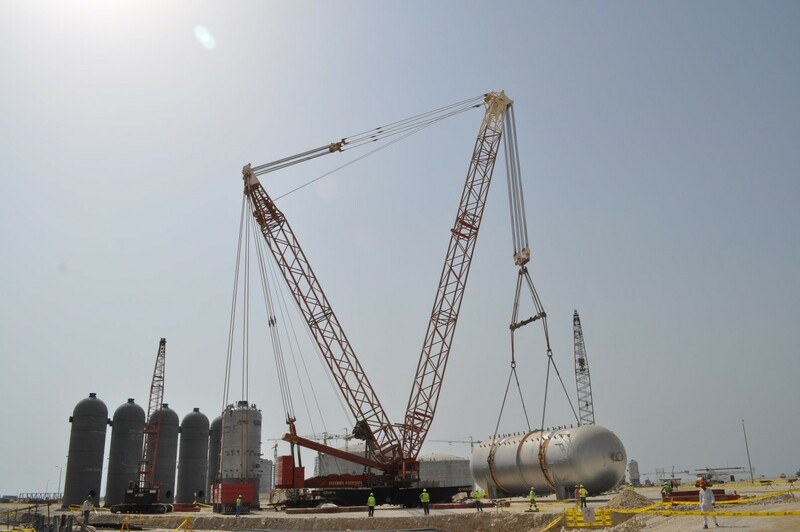 One pool of equipment and professionals is then put at the project’s disposal for the safe execution of all lifting and transport activities on site. AmirKabir’s approach cuts both ways: the overall interest of the project is safeguarded and each contractor involved is able to focus on his core responsibilities, having all necessary equipment and services with regard to heavy lifting and transport at their disposal. There are more advantages with this approach: a single point of management means communication is simplified. One team that operates all equipment means fewer operators are on site and labor costs are reduced. Moreover, standardization of job preparation and execution leads to increased safety and efficiency. Also, less equipment is needed, which means better utilization, adding even more to efficiency and cost-effectiveness. Last, but not least, less equipment reduces costs associated with mobilization and demobilization. AmirKabir has the largest and most modern fleet of lifting and transportation equipment in the world. This fleet is subject to stringent maintenance programs, safeguarding its reliability and safety. AmirKabir`s operators and project managers have deep expertise in a variety of construction projects all around the world. They have been trained to work according to the strictest safety standards with an extensive understanding of complex, multi-party construction projects. This is demonstrated in AmirKabir`s site-wide construction services that optimize utilization of all lifting and transport equipment, increase safety and ensure productivity of the plant on or ahead of schedule. 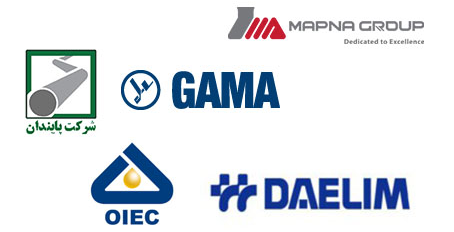 AmirKabir provides and entire line of all terrain cranes by many brands such as Kato, Tadano. From the 60-Ton to the 600-Ton, these highly cranes are cost effective, safe, and efficient to deploy. All terrain cranes are advantageous because they feature long booms with high capacities. Our all-terrain cranes are only available operated by our highly trained Local #150 Crane Operators to ensure the best possible outcome in terms of your project’s safety and profitability. Maintenance – Equipment rented on a day-to-day basis includes full maintenance. The user needs no repair shop, spare parts supply, mechanics, or maintenance records. Breakdown – Costs related to breakdowns of owned equipment are not applicable to rented equipment. When rented equipment breaks down, it is replaced, thus less down time. Warehousing – Warehousing facilities are seldom needed for rental equipment. Renting makes it possible for contractors to operate with less overhead. Mobility – Equipment rental offers the contractor or customer mobility that does not exist with owned equipment. A contractor can bid on a job several hundred miles away based on renting equipment needed near the jobsite. Availability and convenience have become one of the strongest arguments against ownership. Personal Property Taxes and Licenses – There are no personal property taxes or license costs for rented equipment. Inventory Control – Another advantage in renting is better inventory control. Contractors have less inventory loss due to theft when equipment is rented. Equipment signed for at an equipment rental business which must ultimately be returned is watched with sharper eyes. Obsolescence – Day-to-day renting eliminates obsolescence. Ownership risks being handicapped with slow, unwieldy equipment. An equipment rental business provides the latest types and models of equipment. Correct Equipment for the Job – Ownership forces another kind of inefficiency through use of the wrong size of type of equipment for a given job, even though the equipment is not obsolete. This can mean additional, though hidden, costs. Rental insures the correct equipment for the job. Minimum Equipment for the Job – Equipment ownership becomes particularly expensive when the equipment is idle. When ownership of basic equipment is combined with rental; as needed, idle time is minimized. Cost Control – Better cost control is possible with rented equipment. Knowing the true costs of owned equipment is difficult. Rented equipment offers once accountable cost figure – that shown on the rental invoice. Conservation of Capital – Renting conserves and frees capital for other, potentially more profitable uses. Increases Borrowing Capacity –The equipment user who rents rather than buys finds borrowing easier because they have a better ratio of assets to liabilities. Since the equipment does not appear as a liability on his balance sheet, the normal line for bank credit is not disturbed. This can be important in securing construction bonds. We pride ourselves on delivering outstanding customer service to a nationwide customer base. AmirKabir’s professional team supports our customers’ project cost control efforts, while maintaining a safe work environment. Our excellent service, accident-free work record and having the most state-of-the-art equipment in the industry has allowed us to develop lasting partnerships. We provide crane rental services, plus aerial lift and tell handler rental, sales and service, nationwide to a wide variety of industries. AmirKabir has two world-class equipment repair & maintenance facilities to tackle any of your service and repair needs.